As a child, you likely heard some variation of the cliché, “Eat all your food; there are starving people in the world.” While hunger remains one of humanity’s greatest challenges, the underlying causes are not as clear as one might think. Shockingly, one-third of all food produced for human consumption worldwide is lost or wasted. In the underdeveloped world, upwards of 600 million tons of food are lost annually due to poor infrastructure, lack of access to food processing facilities, and unfair markets. 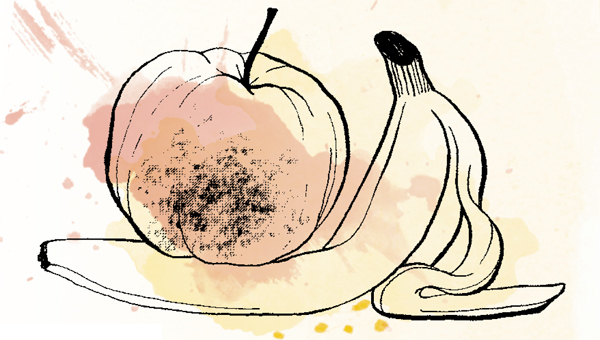 In the United States, 33.5 million tons of food waste are sent to landfills each year. The Food and Agriculture Organization of the United Nations (FAO) estimates that the direct cost to producers of food that goes to waste is currently $750 billion annually, excluding the seafood industry. Food waste and loss not only contribute to the global hunger crisis, with close to 800 million food-insecure people, but they account for a significant amount of greenhouse gas (GHG) emissions in the form of methane. According to the FAO, “Without accounting for greenhouse gas emissions from land use change, the carbon footprint of food produced and not eaten is estimated at 4.4 gigatons (billion tons) of CO2 equivalent: as such, food waste ranks as the third top emitter after the U.S. and China.” According to the Environmental Protection Agency (EPA), food waste in the United States accounts for approximately 17% of total methane emissions. And pound for pound, the comparative impact of methane on climate change has been twenty-five times greater than CO2 over a 100-year period. In the Global North, efforts are underway to reduce food waste at the consumer level by reducing portion sizes at restaurants, reforming food date labeling and educating consumers about proper food storage. Additionally, retailers and manufacturers can drastically reduce food waste by adopting widely available best practices. In the underdeveloped world, where most of the food loss occurs closer to farms and local communities, significant positive impacts can be gained via inexpensive investments in regional markets, refrigeration and local transportation. Lastly, composting food waste and scraps (coffee grounds, banana peels, etc.) can not only reduce methane emissions, but can return nutrients to the soil, close the nutrient cycle and even stimulate carbon sequestration. To have any impact, however, all these tactics and interventions must be institutionalized. But, again, we should be clear about the true underlying causes of hunger. 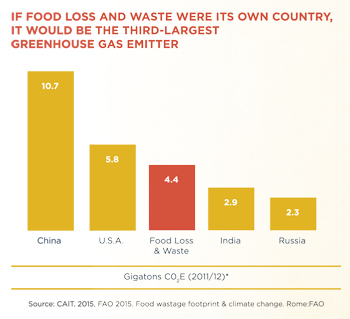 While addressing food waste and loss will reduce GHG emissions, it will not necessarily alleviate hunger. In fact, many countries that suffer from hunger, often also have food surpluses and/or export food abroad. At the global level, there is actually an overproduction of food, with more than enough to feed an ever-growing population. As Frances Moore Lappé has remarked, “Hunger is not caused by a scarcity of food but [by] a scarcity of democracy.” Hunger, and food waste and loss, are symptoms of larger, structural issues, like debilitating national debts, unfair trade agreements and poverty. Indeed, addressing the root causes of hunger, food loss and climate change will require a radical transformation of the global food system.